Bonjour, sweeties! Here's a food byte that may be of interest to those who love to eat--a limited run play about FOOD, in NYC! Here's the 411 from the press release. FOODACTS: A New Play Conceived and Directed by Barbara Bosch. FOODACTS is a culinary stage adventure which explores our primal connections to food and its power to unite. Through an entertaining encounter with established novels, colorful poetry, historic essays, personal letters and other literary works by Langston Hughes, Proust, Homer, and Dickens, among others, FOODACTS serves up the joys of food and eating. It goes beyond the mere palate, revealing how human beings relate to and obsess over food from as far back as The Bible to today. In this era of myriad reality television shows devoted to virtuosic food preparation, and vast amounts of newsprint concerned with the latest cooking innovations and restaurant reviews…now is the time for FOODACTS! (no performances on Sun. 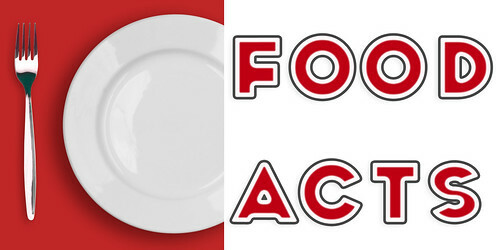 2/10 or Wed. 2/13) The run time for FOODACTS is approximately 90 minutes with no intermission. Cost: Tickets are $18 (+fees) and can be purchased by visiting Telecharge.com or by calling 212-239-6200.